Sleek vintage style and premium craftsmanship combine in this piece. Exacting techniques are used to craft Geneva’s metal rings with flawless step details. The glossy outer layer of the heavy opal glass gives added polish, while the translucent inner layer evenly diffuses bright light. A twist-and-lock design conceals all mounting hardware for an especially sleek appearance. 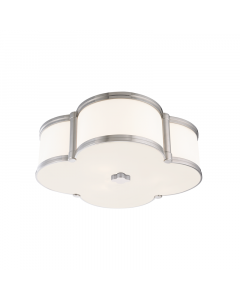 Available in five finishes: Aged Brass, Old Bronze, Polished Chrome, Polished Nickel and Satin Nickel. Please select finish from the drop down menu below. It measures 4.75”H x 12.25”Dia. The canopy/backplate measures 10.5”. The Shade 1 Top W/Dia measures 10.13”. It takes (2) 60 watt max, 120 VAC bulbs (not included). The socket type is E26 Medium Base – A19 bulb. UL Rating is wet. Shade dimensions: 10.13” top, 11.25” bottom and 4.38” height. 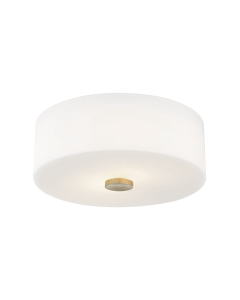 The opal/glass shade has a twist lock attachment and has a glass material. Ships via UPS. Click on image for greater detail.